Within the last year, the outbreak of Zika virus infection in Brazil became a “public health emergency of international magnitude and concern”. The global discussions about the risk of Zika virus infection for pregnant women ahead of the Rio de Janeiro Olympics Games and the fact that athletes who had been training for many years considered cancelling their participation underline the significance of this threat. The Zika virus is a so-called arbovirus that is transmitted by mosquitoes (especially mosquitoes of the Aedes type) first identified in 1947 in the Zika forest in Uganda, Africa. The vast majority of people infected with Zika virus have no or minimal symptoms which may include mild fever, headache, pinkeye, joints and muscles pain, and a skin rash for 2 to 7 days. Fig. 1. 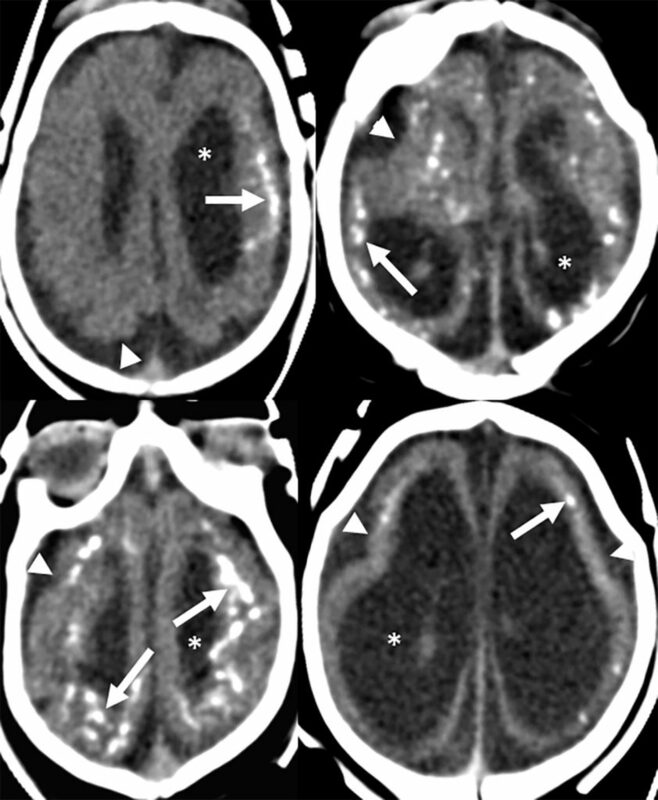 Head computed tomography (CT) images in 4 infants with prenatal infection by the Zika virus shows multiple intracranial calcifications (arrow), enlargement of the lateral ventricles (asterisks), and a smooth surface of the brain (arrowheads). When a pregnant woman is infected by the Zika virus, the consequences may however be severe for the fetus. Since the outbreak of the Zika infection in Brazil, the number of babies born with a small head (microcephaly) increased by a factor 20. A link between a symptomatic Zika virus infection during pregnancy and microcephaly is suggested. In our study, we aimed to better understand what is happening/happened in the brain of the babies who were infected by the Zika virus before birth. Therefore, we studied the head computed tomography (CT) imaging findings of 23 infants who had been infected by the Zika virus before birth. In all children, multiple calcifications were noted within all regions of the brain (Fig. 1). Intracranial calcifications are typically seen in children with prenatal brain infections. Intracranial calcifications in children with prenatal Zika virus infection represent a reaction of the brain to chronic tissue damage secondary to the viral infection. In all children, the brain surface appeared to be smoother than normal (so called hypogyration), compared to the highly complex brain surface seen in healthy babies (Fig. 1). This kind of abnormality is due to an abnormal development of the brain during pregnancy and is linked to epileptic seizures. In all children, an increased amount of fluid was seen within the brain’s ventricles. In general, the brain can be subdivided in white and gray appearing tissue/matter. In our series the white matter appeared reduced in volume and abnormally dark suggesting injury or abnormal development of the white matter in infants with prenatal Zika virus infection. This overall volume loss explains the small heads/microcephaly. Finally, in about three quarters of the infants we found that the cerebellum, an important smaller part of the brain, was too small suggesting that its development may also be abnormal in children with prenatal Zika virus infection. These brain imaging findings suggest that Zika virus during pregnancy may interfere with the normal development of the brain. Our observations have recently been confirmed by animal studies and highlight the importance of protecting pregnant women from mosquito bites because this is currently the only way to prevent the development of Zika related brain anomalies in fetuses. Computed Tomographic Findings in Microcephaly Associated with Zika Virus.